Students may have been wondering why there are tags hanging on trees. Suzanna Scott, professor of New Century College’s Art, Beauty, and Culture course, and Lynne Constantine, professor of The School of Art’s Aesthetics course, decided to bring the Wish Tree Project to the George Mason campus as part of their curriculum. For those who don’t know, Yoko Ono originally started The Wish Tree Project in 1996. 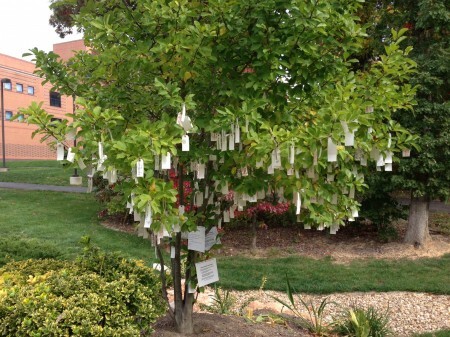 Scott says, “People participate in the work by writing their personal wishes for peace on white shipping tags and tying the wishes to a tree branch.” This project was started on the George Mason Campus on October 1st and will end on October 18th. Once the wishes are taken down on the 18th, they will be shipped to Reykjavik, Iceland where Yoko Ono is collecting all the wishes and building a memorial for her late husband, John Lennon. Both Constantine and Scott were eager to bring this project on campus in order to inspire their students to work together in order to learn more about the origin of this project. The Wish Tree Project is a national and international symbol of the future. It collects people’s wishes and hopes for a better world. By bringing this project to our school, both Scott and Constantine are allowing their students to be part of a project that connects them with people all over the world. Their wishes will be put in a memorial with the wishes of people from all different walks of life. Scotts says that one of the most valuable parts of this project is that it can be replicated.